To my amusement, both of them were also deeply puzzled by the fact that, at the time they were composing their email messages, there had not yet been a post on Pad Thai on this blog (update: my Pad Thai recipe was published on November 26th, 2011). Years ago, I would have responded in juvenile petulance. These days, I just sit in front of my computer, smiling to the screen and blinking a lot. I’ve since explained my reasons to both individuals. And now, with permission from them, I thought I would also set the record straight. For several weeks, I carried on my existence with a mental draft of a post addressing these issues in the back of my mind. I mentally wrote that post, rewrote it, and revised it for weeks with no signs of its imminent materialization. I have a tendency to over-analyze things like that, and conveniently use the time it takes to think things through to justify my procrastination. 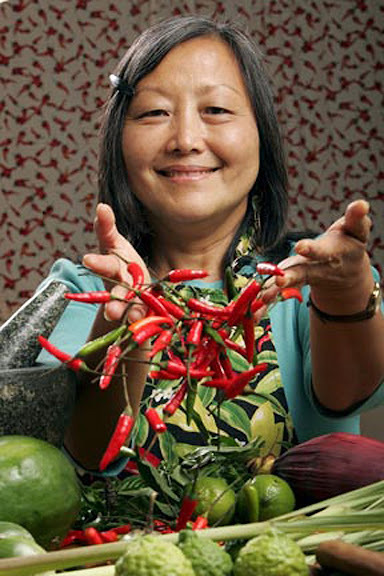 Then one day, I had the opportunity to speak with Kasma Loha-unchit, Thai cooking teacher and author of It Rains Fishes (winner of the 1995 International Association of Culinary Professionals award for Best International Cookbook) and Dancing Shrimp. Kasma’s books are well written and devoid of any obvious ambition to appear the encyclopedic, “last word” Thai cooking resources. They’re written from a place any Thai can relate to. Her recipes work. Her knowledge of the Thai culture and cuisine is first-hand. The Thai-English transliteration system used in her books, though different from what I would employ, is consistent and evident of her Thai language competency. For once the Thai language is treasured instead of horrendously butchered, as it almost always is, in English-language books on Thai cooking. A bonus for me from having that conversation with Kasma is that, after having a good talk with her, the post which I had not been able to bring myself to write (i.e. this one), all of a sudden, up and wrote itself. It was quite amusing as my initial intention was to get from Kasma some helpful tips on Khao Chae, a favorite Thai New Year dish, about which I was in the process of writing at that time. As it turned out, Kasma isn’t a fan of Khao Chae and, therefore, has never made it. We then proceeded to talk about other things. Though Kasma and I disagree on some minor points, we share the same sentiments on pretty much all of the major things one of which is that unless you have all of the fresh herbs and spices required to make authentic and traditional Thai curry pastes, you’re better off using commercial curry pastes than trying to make do with ill-advised substitutes. It’s true. I’ve been wanting to say that out loud for a long time. 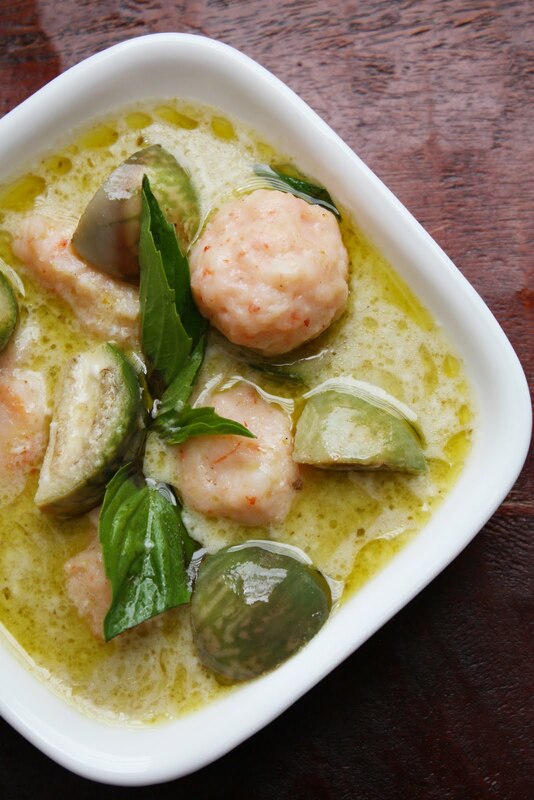 Fresh galangal, lemongrass, kaffir lime zest, shrimp paste, cilantro roots, and other essentials of proper Thai curry pastes are not always readily available in all areas of the world. If you’re blessed enough to have all of the necessary fresh ingredients at your disposal, by all means, make your Thai curry pastes from scratch. They are fresher, more fragrant, and will undoubtedly result in curries of greater quality than even the best brand of commercial curry paste can ever produce. But if you happen to live where these ingredients aren’t always available fresh, I strongly encourage the use of commercial curry pastes. In this situation, using commercial curry pastes should not be considered a stigma or a threat to one’s ego, but a deliberate choice wisely made in the face of not-so-promising alternate routes. I wholeheartedly agree. Knowing — really knowing — how things are supposed to taste is prerequisite to creating those things. Without that knowledge, one is shooting at an invisible bull’s eye. For the record, Thai green curry paste is green because of the color of the fresh green chillies in the paste. An angel loses his/her wings every time a Thai green curry paste recipe calls for fresh green leafy herbs (which will only oxidize and turn your curry brown). And every time a Thai green curry paste recipe calls for fresh red chillies, a wingless angel jumps off a cliff. One quick Google search will reveal that these misguided recipes exist in abundance. I can’t help but deeply feel for the end users who invest money, time, and effort into those recipes just to find that their curries don’t turn out like the Thai curries they’ve had in Thailand or at their favorite Thai restaurants. And it saddens me to think that when this happens, people often blame themselves instead of the recipes. Bottom line: If you don’t have each and every fresh ingredient required to make traditional Thai curry paste, don’t go for inferior substitutes; use commercial curry paste. Commercial curry paste? This from Kasma Loha-unchit, who recently made the 2010 Saveur 100 list, who most people would assume would go, “tsk, tsk, tsk,” at those who use ready-made Thai curry pastes? Surprising, isn’t it? For reasons stated above, no, not really. This kind of answers the question raised by the previously-mentioned readers who asked why I had not included instructions on how to make Thai curry pastes from scratch. Unless you live in a major metropolitan area where fresh herbs and spices used in Thai cooking are grown or flown to, or are willing to pay extra money to have those fresh ingredients shipped overnight to you from online merchants, chances are making authentic/traditional Thai curry pastes from scratch is nigh impossible. One day I will blog about it, though. (Added Nov 26, 2011: I finally added my Pad Thai recipe!) I just don’t consider it a top priority. For me, it’s a heck of a lot more fun to introduce to you the vast array of Thai curries — far beyond green and red — and how you can make all of them at home easily. All that with commercial curry pastes and no guilt. The one minor point which I differ from Kasma is on which kind of commercial paste to use. She prefers the type that comes in a plastic vacuum-sealed bag and deposited in a plastic tub. “The flavor is fresher and cleaner,” Kasma said, comparing it to the type that comes in a (usually 4-ounce) can. The curry paste that comes in a can has been processed at much higher heat and its flavor, as a result, is muted. I, however, am a fan of canned curry pastes. I always have at least 8-9 types of curry pastes in my pantry, ready to use any time a craving hits. I usually use the whole 4-ounce can at once with nothing left to store either in the freezer or refrigerator. The type that comes in a plastic tub is definitely fresher tasting, but I find that I don’t use one type of curry paste extensively enough to go through an entire (14-ounce or more) tub before it becomes dried, hardened, and tasteless in the refrigerator in less than two weeks. The canned type also comes in more varieties. And I like variety. One minor difference aside, Kasma and I discussed how Thai coconut-based curries are supposed to have a layer of glistening coconut fat on top. “That makes the curry more appetizing,” Kasma said and I responded with a thunderous yes. I was immediately reminded of that reader of mine who asked why following my curry procedure had resulted in his curry “splitting.” You see, when you make the curry base by “frying” curry paste in coconut cream, you want to see the separation of coconut fat and curry paste. The cooking term, “กะทิแตกมัน,” is used by the Thai to refer to the stage at which the coconut cream is broken down by heat and the fat separates. While many curry vendors — even some hotel chefs — cheat by frying the curry paste in vegetable oil and pouring vegetable oil on top of the finished curry to achieve the same effect (visually), that wasn’t done in the old days. The fat from the first extraction of coconut milk is what creates a good curry base, not vegetable oil. This is the standard curry procedure. 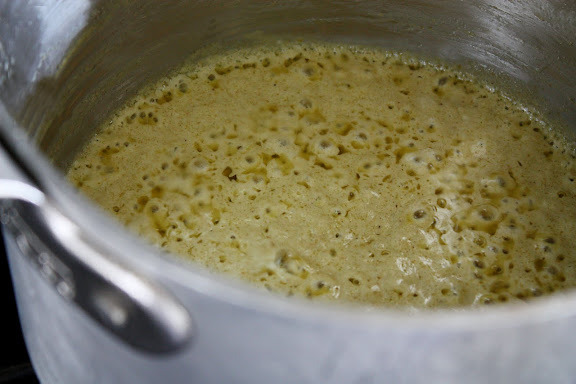 While emulsification is generally a desirable quality in western cream soups or sauces, a good Thai coconut-based curry is not supposed to look like a colloidal suspension of coconut fat globules. And the orange or green fatty film on top of your curry is not an ugly thing; it’s a sign that your curry is done correctly. Yet, I am still planning on inching my way towards sharing my own Pad Thai recipe and my Pad Thai sauce formula. There are just a few more individual ingredients to introduce to you before that can happen. Also, as I mentioned above, I’ll eventually get to a post on how to make Thai curry paste from scratch. However, for now, let’s start with making a good — really good — curry based on Kasma Loha-unchit’s Easy Green Curry recipe. 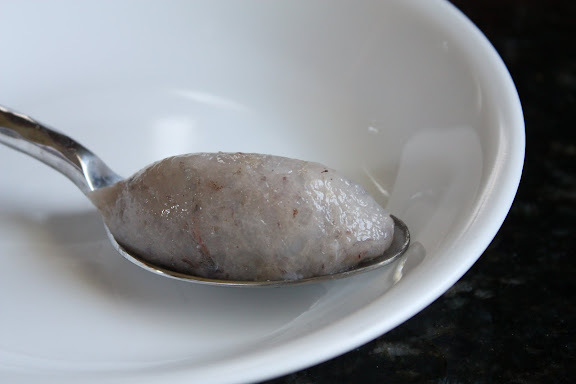 Instead of pork, I made shrimp dumplings by blitzing one pound of shelled and deveinedshrimp, one egg white, a couple of teaspoons of fish sauce, a tablespoon of corn or tapioca starch, in a food processor. The mixture is then brutally stirred to achieve elasticity (per instructions on how to make Thai fish cakes), formed into either quenelles or bite-sized balls (or both! ), and gently dropped into the curry base. The shrimp dumplings take less than a minute to cook. The result is a pot of delicious Green Curry with Shrimp Dumplings (แกงเขียวหวานลูกชิ้นกุ้ง), albeit sans krachai, which is terrific over rice or rice noodles. Yes, it’s made with commercial curry paste. And if any uppity gourmand gives you a hard time because you use the curry paste which you didn’t make from scratch, show them this post. *While there’s room for creativity and interpretive freedom in the Thai cuisine, certain things seem to be written in stone. Using wrong ingredients in Thai curries, for example, may result in curry-esque dishes that are vaguely Thai, but the natives would detect the odd flavors. Those results may be pleasing to many people and actually great dishes on their own merit. But when one uses cilantro leaves and lime juice to make one’s “Thai” green curry paste, one is certainly not going to end up with the traditional version of Thai green curry as the natives know it. leela, you may be a bit of a curry snob, but i think food snobs are the most important culinary people out there. For example, if I had not been there to point out to my boyfriend that ginger doesnt go in chicken parmesean, somewhere, an italian grandma would be crying without even knowing why. Dont appologize for trying to keep your traditional food culture alive. I agree, substituting traditional ingredients does make for delicious dishes, but theyre just not the same when it comes right down to it. this recipe looks so delicious, i really want to try it, and maybe it just just my computer, but when i tried to pull up the recipe, it said the link was broken. Fantastic post! This cleared up a lot of questions I had about Thai curries and Thai cooking in general. Thank you so much for this great backstory on “authenticity” and Thai cuisine. A great insight into Thai cooking, thanks so much! The curry looks so good with those ground shrimp balls, yum! I’m so glad you tell us to use commercial curry pastes and which ones to buy. If every thai cookbook or blog said to make your own curry paste at home, I would have been too intimidated (and broke) to ever make thai food myself! Agree! How about adding peanuts to a dish and call it ‘Thai’? I love your food photos. They are beautiful! o my god. thank you so much for writing this. you took the words right out of my mouth. i really hate those stupid thai curry recipes that have coriander and basil leaves in the paste. I mean … WTF!!! I absolutely LOVE your blogs and look forward to each new one. I have taken many classes from Kasma and am fortunate to live in an area where we get many of the freshest Thai ingredients. How wonderful that you got to meet her. She’s a star! and a fabulous teacher. Thank you for your comments about Thai curries. They make making a Thai dish a little less time consuming. As a longtime student of Kasma’s I can only say “YES” to many of your points. I hate dumbed-down recipes that offer substitutes. It’s a waste of everyone’s time and doesn’t taste the same as the real thing. So glad you finally talked about curries! I’m sad to find that my carefully concocted green curry isn’t nearly as “authentic” as I wanted it to be, but happy to feel vindicated buying commercial curry pastes. Thanks for a great blog. leela, i had a question while reading this, and i completely understand if the answer is “just because,” but if the curry paste is supposed to be green, and basil leaves are going to be put into it anyway, why are they ommited from the paste? it seems to me that would give it some extra color. im just wondering if theres a specific reason that basil would mess up the paste, or if its just not the traditional thai way of doing things. i hope this doesnt make me sound like a provincial idiot, lol. great post, btw! those poor angels, you’re helping to save them! Mary – Believe me. You don’t sound like a provincial idiot! Let’s see. First of all, the basil leaves are added at the very end of the cooking process. Personally, I add them after the pot has been taken off the heat. Then I let the residual heat wilt them. I don’t want to cook the basil as I want that burst of basil fragrance in my mouth when I eat it. Pounding the basil into the paste, therefore, kind of kills what basil has to offer, in my opinion, since the paste is one of the first ingredients to go into the pot. Also, “green” curry is a *bit* of a misnomer in the sense that it’s not really green. I’d say it’s more yellow with a tinge of green than green green, if that makes any sense. With fresh basil leaves being so prone to oxidation, pounding them into the paste and heating them to death, I guess, would cause the color to be brownish green than bright, vibrant green. Even wilted fresh basil leaves added at the very end turn dark brown upon standing in just minutes. But I would have to experiment to see what transpires. Thank you so much for posting this. I will have to look around your site some more. I only recently discovered my love affair with good Thai food while in DC and St Louis and have ever since been on the quest for Thai. I have never prepared Thai food myself because – since it is still relatively new to my culinary experience – its intimidating (lots of ingredients I never had as a child). I don’t have the experiance to know the differences between curry pastes yet. This post really inspires me to A) read more of your posts and b) try cooking Thai food! I’m thai. My mom is a wonderful cook, and she told me to use commercial paste as well. She said unless I have all the fresh ingredients and have time to sit there and use the giant motar and pestal to make a paste, don’t even bother. It’s good to know how to make it from scratch, but logically, it’s very time consuming, and not too practical. 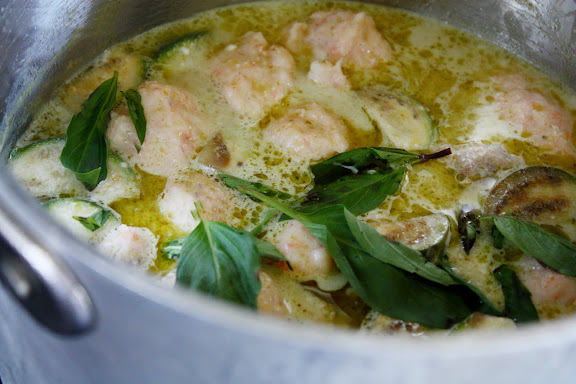 When you crave thai green curry, you don’t want to spend ALL day preparing it. I’m also pretty sure that most restaurants use the curry paste as well. My commercial-paste-using guilt dropped away the day my Thai grocery lady told me that most Thais use them too, and enliven them with some fresh spices of the same kind as are in the paste. I am a fan of Kasma’s books and website, too. I just found your site, and congrats on how nice it is. Anonymous – Appreciate your comment. Most Thai restaurants outside of Thailand use commercial curry pastes as well. What sets them apart from each other is the way they doctor up the curries with different add-ins. awesome post. really, really nicely written (and being really nice!). your blog is good b/c you are a teacher and you KNOW your stuff. It is obvious when you read your blog – in fact, you are the type of blogger i believe when you tell me it’s ok to use pastes. Others I may not believe. gotta make those shrimp dumplings. all too easy! I’ve been trying to figure out for a long time how to get those blobs of fat in my coconut curries. I lived in Bangkok for a while, and every curry I ate there had this, but until you explained the process of cooking the coconut milk and paste until it separates, I could never replicate this. I just learned so many interesting things in this post! I’ve been reading Cradle of Flavor about Southeast Asian cuisine (but not Thai cuisine), and Oseland wrote about fat separation in coconut milk curries. He suggests looking for it as a sign that the curry is properly cooked. I have some pretty, little eggplants that I’m looking forward to cooking in a curry this weekend. This was such a hit that it has become a family staple. I made the shrimp dumplings; so light, tasty and airy. Thank you! I don’t care much for canned curry pastes. They are full of SALT and sometimes sugar and oil… and they don’t taste very good, to me. It is like Prego versus a fine italian restaurant.. but if you’re cool wit Prego… crack open the can of Masseri or Mae Ploy .. and go really easy on the fish saurce or omit it entirely! Brett – If canned curry paste is Prego, what, according to your analogy, represents a fine Italian restaurant? 1. If the answer is curry pastes made *the right way* with *all* of *the right fresh ingredients* from scratch, then if you’d read the post, you’d find that I am in complete agreement with that. 3. But if a fine Italian restaurant is analogous to the curry pastes that come in plastic tubs and Prego represents canned curry pastes, then your analogy is unfairly exaggerated, in my opinion. The idea that getting fresh ingredients to make authentic curry paste is “nigh impossible” has not at all been my experience. It takes a moderate bit of effort… some online shopping and planting. It is well worth the effort to taste the spectacular heights of Thai cuisine. I make my curry pastes with the right ingredients and the flavor is incomparably richer and more luscious than anything I could get from a can or in a restaurant. I grow a kaffir lime tree ($55 on eBay) in my south window for leaves and rind, and I grow coriander ($2 in Home Depot’s garden department) in the summer for the roots and then freeze ’em. I get grachai (wild ginger) from a jar, fresh lemongrass + galangal and tumeric roots from the Asian store. Also resh bird chiles from the Asian store. Dried big read chiles from the Mexcian grocery. Nutmeg + cumin + corriander seeds + white pepper + mace from the spice shop. If you live in a metro area with Asian stores, toughest items are kaffir lime rind and corriander roots. You CAN substitute twice the amount of shredded kaffir lime leaves for lime rind and get a QUITE SIMILAR and not bogus flavor.. and you can substitute twice the amount of corriander stems for roots… and the flavor isn’t as medicinal and clean… but it’s halfway close. I understand some people are not up to the challenge of tracking down the ingredients and growing their own plants – but if you’re up for the challenge, you will enjoy incomparably more delicious curries. i used the commercial curry because i don’t have time to do so. i think curry from the can it not much different than homemade.even my mother and people i know in thailand still buy them from the markets.they didn’t make it fresh. it also depend on another ingredients to taste better. Brett – Agree. I see your point. Thai food devotees who have the kind of living space and money to grow the ingredients themselves or have them overnighted to them should do so, especially if commercial curry pastes don’t meet their standards. I don’t think anyone would argue with the fact that fresh is best. The main point of this post is not to glorify commercial curry pastes or to dissuade people from going for the best, but to help them be able to tell bad curry recipes from good ones. The secondary point would be that if fresh ingredients are beyond their means, using commercial curry pastes is by far better than using those ill-advised recipes. People are at different points in their journey into the Thai cuisine, and many of them are not yet where you are, Brett — where they know the appearance and taste of every single unfamiliar ingredient. I don’t think many of them are at the point where no curries except for homemade are good enough. They search the internet, armed with little knowledge about Thai food, looking for what may work. Most of the time, they see either poor developed recipes that call for poor substitutes or hard-core recipes that requires ingredients they have to grow themselves. If directing these people to commercial curry pastes means that they won’t throw in the towel altogether and that they have something to hold on to while easing into the more advanced stage, then I think this post has served its purpose. Do you grow your own ingredients or have them overnighted to you? For those who use commercial curry pastes, does Brett have a point in saying that you do that not out of necessity but out of choice? Do you settle for commercial curry pastes because you’re not up for the challenge in sourcing/growing your fresh ingredients? If so, are people who advocate the use of commercial curry pastes due to the absence or scarcity of fresh ingredients “enablers”? I’ve made my own curry paste a couple times but it is a once a year kind of thing. I can find cilantro root at the farmers market and other ingredients at the asian grocery store. I live in St. Paul, MN. I love getting your permission to use the canned paste. My only issue (and I am a complete novice, adventurous though I am) is that it is so spicy I can’t add as much as I want for the flavor because it ends up too spicy. I like making my own because I can tone the heat way down while keeping plenty of the other flavors. It may not be as balanced as it should be, but we like it. Sarah – That’s my biggest complaint about prepared curry paste as well, especially the ones that come in plastic tubs. I find them to be much hotter than the canned kind. A lot of people disagree with me on that one, though. You tell them! You put so succintly and patiently in words all I’ve ever wanted to say about Pad Thai and Thai curries. My mom is Isaan, and the Thai food I grew up with was so different than what most think of as Thai food. (If people are squimish about fermented shrimp paste, they will definitely pass out from pla raa!) I can’t remember ever once eating Pad Thai at home and people always give me an astonished look when I tell them I didn’t try pad kee mao until I was in my 20’s. It’s only non-Thai people who think it’s a stigma to buy curry paste. I once asked my mom if she ever made her own, and she just laughed. Even though she grows lemongrass and has a kaffir lime tree, she prefers the store-bought kind. I loved reading this post. I also liked what DP said about it being a non-Thai stigma buying curry pastes. I feel much better for the fact that I have been using pastes now! To be honest, I know I could find all the ingredients if I really needed to here in Southampton, UK but I just don’t think it would turn out as nice- I have a tendency to muck up whatever I cook, so sticking to pastes is probably better for me and those who’ll eat my food! We have plenty of Asian stores and world stores around here and I even found Galangal in my local supermarket spice section the other day. World cooking has become so popular now that I’m sure most people in the UK can find whatever they would need but why go through all that hassle if you can get it already made for you?! That being said to encourage folks to give a try at cooking Thai dishes I highly recommend using a commercial curry paste. Many Thai recipes are so easy and amazing-like Gai Kaproa/Basil Chicken which with steamed jasmine rice is the ultimate 30 minute meal. I cook Thai several nights a day and often grab a tub of curry paste or one in the plastic envelopes for an easy and quick meal. I am fortunate to live here in the SF Bay Area (15 minutes from Kasma) and have 7 bai magroot trees, always grow many Thai chiles, basils, pea-eggplant, lemongrass, winged beans, etc. in our garden. If out of season we have a plethora of Asian markets nearby including the huge 99 Ranch markets with so many fresh seafood options. They are a Chinese market, but the veggies and seafood selection is pretty good. 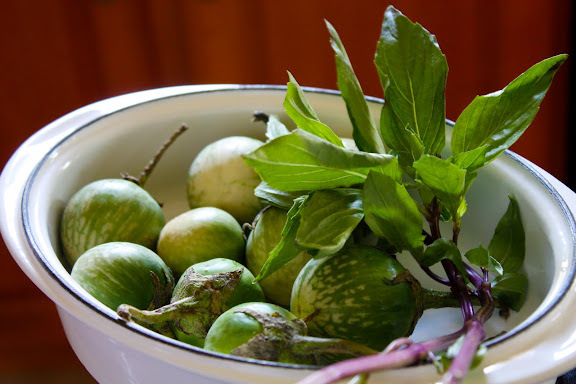 Another amazing local option are the Hmong and Laotian farmers who grow gorgeous basils, eggplants, and those fiery cream colored chiles that will get your attention. Kasma taught us our first Thai recipes and more importantly of the ingredients and techniques. My husband is a master at the rhythmic pounding-scoop-pound-scoop with our Isaan clay mortar and teak pedestal. I will say making your own curry pastes is an amazing therapeutic venture-relieves all kinds of tension! I always laugh at the requests for a Pad Thai recipe. I much prefer Pad Kee Mao/Drunkard’s Noodles, but there are so many real Thai dishes that I shudder at the catsup noodles or worse yet, oh my this kills me, peanut butter noodles. Why oh why do so many think putting peanut butter in something makes it Thai? First off, peanut butter in Thailand – nada except in ex-pat stores. Raw peanuts roast up so nicely and quickly, which hand chop/pound for a garnish if you must. There are a few ingredients that are elusive even here in Cali (Little Thailand) – fresh green peppercorns, also fresh Kra Chai-frozen is the best I can do for either of these. Another favourite elusive ingredient is the smoked large chiles I can only buy from one woman at the back of Warrorot Market in Chiang Mai. They are grown and smoked by Hill Tribe people. They are about the size and shape of anchos but VERY different. I do miss the fresh baby corn and have grown it-so cute only about 3’ tall. Fresh straw mushrooms are amazing, sort of like the difference in tinned water chestnuts and fresh. I am fortunate to live here in the SF Bay Area (15 minutes from Kasma) and have 7 bai magroot trees, always grow many Thai chiles, basils, pea-eggplant, lemongrass, winged beans, etc. in our garden. If out of season we have a plethora of Asian markets nearby including the huge 99 Ranchmarkets with so many fresh seafood options. They are a Chinese market, but the veggies and seafood selection is pretty good. Kasma taught us our first Thai recipes and more importantly of the ingreients and techniques. My husband is a master at the rhythmic pounding-scoup-pound-scoup with our Isaan clay mortor and teak pedestal. I will say making your own curry pastes is an amazing theraputic venture-relieves all kinds of tension! I always laugh at the requests for a Pad Thai recipe. I much prefer Pad Khe Mao, but there are so many real Thai dishes that I shudder at the catsup noodles or worse yet, oh my this kills me, peanut butter noodles. Why oh why do so many non-Thais think putting peanut butter in something makes it Thai? First off, peanut butter in Thailand-nada except in ex-pat stores. Peanut butter has all sorts of emulsifiers and stuff in it. YUK! Raw peanuts roast up so nicely and quickly, then hand chopped for a garnish if you must. I have been learning Thai and Isan/Lao recipes for 25 years during 30+ trips to The Kingdom of Thailand. Our last trip was for two months. We have been fortunate to be there for the King’s birthday (Dec 5) several times. We first started traveling to Thailand with our children when we “adopted a small Akha Hill Tribe. We’d spend Christmas with them bringing in medicine, warm clothes, and sometimes bringing doctors to help this small village. We first traveled to Thailand as we loved the cuisine, now it is the love of the culture. Wandering small village markets small to the craziness of Chatuchak Park. Sorry to have rambled on far too long! Egads! This was a great curry. I just wish that I had read the instruction for the fish cakes fully. Really could have used that bowl of water 🙂 Some came out looking like small american footballs. Had to use Japanese eggplants as I can rarely find the round aubergines. The deeper I get into Thai cooking, the more I find canned curry pastes taste disappointing, even slightly disgusting. They used to be acceptable when — like most Westerners — I didn’t have a lucid frame of reference for what an alive, fresh-pounded paste should taste like. There’s something about curry, and in particular.. green curry with its zinging bird’s eye chiles and and clean coriander root and fresh roasted cumin and mace,…. that doesn’t survive storage. Last week I made fresh green curry paste last week and the taste was extraordinary. Tongue-tingling, electrified, neon-lit and busting with flavor fractals. I let half of the paste sit in the fridge for 8 days and made the curry again the following week. The flavor had noticeably depreciated. The last time I made it from a Maseri can… I got an upset stomach. If you love Thai food… go for the real thing! It’s worth it. Anon – Thanks. I agree. The point that a fresh homemade curry paste is superior to a commercial curry paste is uncontested and mentioned in the post. The only time a fresh curry paste is inferior to commercial curry paste is when you use wrong fresh ingredients. The flavor may be fresh and vibrant, but, no, the flavor profile of Thai curry isn’t there. Commercial curry paste is perfect for those who can’t find or afford fresh ingredients every time they want a homemade curry and realize — rightly so — that using bad substitutes is ill-advised. I have just come across your blog, and am thoroughly enjoying the reading. I do agree with most of what you say, however the comments about the strict use of taditional fresh ingredients only in homemade curry pastes I cannot relate to. I’m not disagreeing with you as such, because I would use the ‘correct’ ingredients every time, were I able to get them. In the past I have always been stymied by the unavailability locally of kaffir limes, and have instead used the normal grated zest and lime juice, and I have to say that my pastes, in terms of flavour, are as good as those curries I have eaten in my favourite restaurants and in Thailand and other other south east asian countries. This similarity between what you have eaten before and what you yourself have produced at home, you used as an indicator in discerning the quality of a true Thai curry. My curry pastes fulfil that, which is why I cannot relate to your comments. Like I said, I’m not disagreeing with you as such. I know ordinary limes are no substitute for kaffir limes, in terms of true 100% authenticity, but I have produced great, fresh, flavoursome curries by using it as an alternative. As an added note, I have recently found a green grocer locally who stocks kaffir limes, and as I still have an abundance of chillies from this year’s crop, I will be using the ‘Real McCoy’ in my next batch of pastes. I’ll let you know if I improve on the last lot! Finally some sense on the paste issue. I attempt to sell authentic Thai paste to the good British public and I’m always cringing when people tell me they make their own and discount my ‘commercial’ paste as cheating. I wish they would regulate what is allowed to be called Thai Green Curry. I shudder every time I see an ‘authentic’ paste without shrimp paste! Joe – Ah, and you’re definitely one of those who actually understand what I’ve been trying to say in this post. It’s about using the right ingredients, not where or by whom the paste is made. Thanks! I use the tub curry pastes and add some more of the same ingredients freshly chopped and/or ground, to freshen it up a little. My local Thai grocer told me that this is what most Thai people do too. Its also possible to add complexity to the flavor with other spices, which is far more convenient than making the pastes from scratch. Thais have also said that the locally (in VA) available spices don’t taste the same as they do in Thailand, so the ultimate goal of absolute authenticity may well be unreachable from here. I think Pad Thai is the Thai dish that is least confounding to American tastes – almost Thai food for people who don’t like Thai food. However, I then have to admit that I have come to love it, and make it often. My own recipe is based on Kasma’s, David Thompson’s, and Chez Pim’s, with some additions. I have both of Kasma’s books and agree with you that she’s a treasure. Now, if only my darn electric stove would get hot enough to separate the curry paste…. Btw, I cringed quite a few times as I was reading this post because the recipe I am following for a green curry paste has all the things you said shouldn’t be there – coriander, lime juice, lime leaves, zest etc. I can understand now why it doesn’t taste like the ones I had in thailand. I am a vegetarian and most of the readymade pastes available here contain shrimp paste. That’s why making a paste from scratch is more attractive for me. I get fresh thai ingredients here in the thai supermarkets incl cilantro with the roots, fresh galangal, kaffir lime leaves etc. So I would love it if you post a “paste from scratch” recipe sometime. Anon – Thanks. I’ll post the curry paste recipe soon. In the meantime, try dark miso in lieu of shrimp paste in Thai curry paste recipes. Not to mention, most often I just want to cook with what I have on hand and have it on the table quickly. Ready-made pastes allow me to do that any time. If I had to wait until the Food Police cleared my ingredients list, I’d never get to eat curry. Thanks for saving me from a guilt trip. Pad Thai is so popular because it’s an easy dish to love. A lot of visitors to Thailand just eat noodles and fried rice. On the few occasions I was trapped on the tourist track, I was served fried rice and had to beg beg beg the staff to let me eat whatever they were eating. They were very reluctant and could not believe I could eat anything spicy. Part of it is fear instilled by most guidebooks of anything that may have been left sitting out (which rules out any curry). If you follow the “boil it cook it peel it or forget it” rule, there’s not a hell of a lot of food that’s left to eat. There are many more, but these are the main ones. hi I am not that familiar with thai cusine that’s why I am curious and surf for thai recipes and stumble on your blog, I am not disappointed because I found out it really interesting and would try one of the recipe, The only recipe that I am using curry powder is chicken curry you might smiling when you read this but it is true. hold that fort. good job. keeping authentic dishes current is valuable. thanks. 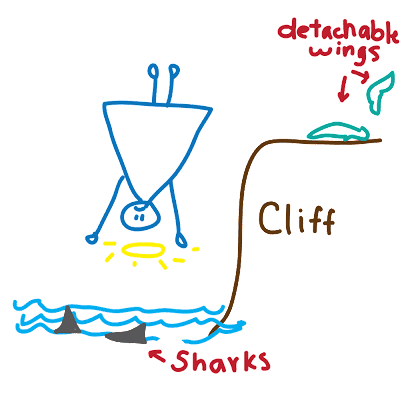 Leela, fantastic blog! I originally stumbled across it when I was looking for a brioche bun recipe and then found all the other amazing recipes you have posted. Love that you have the Dooky Chase pecan pie and a piece on Khasma, among other things. I took a class with Khasma about 12 years ago and her homemade curry pastes and recipes are always hits with my friends. Can’t wait to try some of your other recipes. Keep up the good work! I have a question, but first, and I really enjoyed this post (and I always enjoy confirmation that I am doing things right, given that I am not Thai and I am self taught lol), I do want to point out one problem with the commercial pastes: they are just too spicy for many Americans to be able to use enough of them. I remember one cooking board I belong to once debating whether they could use 2 TEASPOONS of the paste in a dish meant for 4 people! Of course their final dish didn’t taste anything like what you get in a restaurant. But I am willing to mail order any and all necessary ingredients if need be, and mostly I don’t even need to do that anymore. Laura – Thanks for sharing. Yup, you’re absolutely right about one of the disadvantages of commercial curry pastes: the fact that the level of heat cannot be adjusted. I totally know what you’re talking about. With fresh kaffir limes on hand, you definitely can make your curry pastes from scratch. That’s the one ingredient even well-stocked Thai grocery stores don’t have. Too many fresh kaffir limes, Laura? I’m so envious I don’t even want to talk to you right now. 😉 I can’t think of any culinary usage for kaffir lime zest other than as a curry paste ingredient. My great-aunt used to make simple jasmine tea and drop a couple of strips of fresh kaffir lime peel into each cup. She said it was good for you. Exactly how she never did explain. Her tea tasted great, though. I always assumed it was impossible to have a kaffir lime tree in the midwest/north of America, but I have had wonderful success with this, a kaffir graft onto a lemon dwarf (to make it smaller, suitable for being a house “tree”) and highly recommend it to anyone with a taste for Thai food. You do need to live somewhere it can be outside in the summer of course. I had always read that Thai women (traditional cooks anyway) could just go out and pluck the leaves whenever they needed and that just sounded so awesome to me I had to try. And it has been that awesome! If you think a fresh picked lime would last in the mail I’d be happy to mail you one–I can’t decide if it would, what do you think? Laura – Thank you so much for the offer. I do have a house kaffir lime plant. It just isn’t prolific as yours as I’ve never found myself in a situation where I have too many kaffir limes on hand. I think it’s probably a case of karma coming back to bite me in the rear for not appreciating the healthy, beautiful, giving kaffir lime tree we had in our backyard growing up (and resenting it for being too thorny). Leela is SO NOT A CURRY SNOB! She is a PURIST! There is such a UNIVERSE of difference separating these two beings! Two entirely different mentalities. The PURIST has a goal, a mission that lies entirely outside a self-centered focus that characterizes the SNOB, who wants to count coup on the world, i.e. “I am better, smarter, more knowledgeable than you all”. The Purist wants to preserve a tradition, so that it does not get corrupted by the self-important, and the proud, who would deprive the world of its just deserts. So, the Purist is quite a humble person who is working very hard to benefit everyone. In 1988, I had my first taste of any Thai food, in BKK, off a Soi in Sukhumvit, a locale some might not describe as the most auspicious for such an encounter. However, a kindly Thai Sikh gentleman steered me clear of touts and guided me to a fine restaurant and I had my first green curry with prawns. It was not green, but a lovely coconut milk color, and teeming with fresh green chilies on top. Much like a Bengali malai kari but fiercely hot, and utterly delicious; they never asked me for spice levels, probably taking me for a near-native, or at least not a farang!! The next two days I was in BKK, I spent every possible opportunity I had eating just green curry in every guise,to imprint its nuances in my memory. Since then, I have tried to perfect this one dish, and later was asked to cook in Lao-Thai restaurant, as their “curry cook”. I am no expert, but would still want to continue learning how to prepare a great green, red and Panang curry; so, I am grateful to all these native experts for their teachings. It is never possible to duplicate a native palate or a native’s sense of what is “just right” with a dish. That is not to say that all Thai-born are equally gifted because some can have no taste perception, just as I am tone-deaf!! But people like Thompson arouse a certain resistance in my soul with their facile assumtion that they have come to “teach” and “awaken” Thais to their own tastes and culinary heritage. Somehow this sort of omnibus declaration smacks of the “snobbism” a poster wrote about! Not a PURIST, but a true SNOB, this!! A very enjoyable post, thank you! I, too, use Maesri canned pastes. The main reason is, even in the large metropolitan areas of the Northeastern US, it’s not always possible to easily source the ingredients fresh, nor do I have an unlimited budget or unlimited storage space. I am a very experienced cook, and I certainly prefer to make everything as fresh and authentic as possible, but I also indulge in so many different cuisines that, were I to attempt to stock my pantry with all fresh ingredients, Most of it would go bad before I could use it. I always keep on hand cans of prik khing (my personal favorite), green, red, and masaman curry pastes, and usually have a can or two of sour curry paste and kaeng par (jungle) curry paste, as well. To compare to a “fine Italian restaurant”, any halfway decent cook can tell you that unless you have a year-round source for the finest artisanally grown tomatoes, canned tomatoes are the thing to use, and anyone who denies this is delusional, or lying. Yes, the finest of fine restaurants may indeed have those resources, but I know many, many people in the high-end restaurant business, and I can tell you, restaurant cooking is not home cooking. Companies like Maesri wouldn’t exist if there wasn’t a market for them, just like people in the US very rarely make their own ketchup, worcestershire sauce, or mayonnaise, even though those are remarkably easy to make, and almost always taste better fresh or homemade (by the way, I make all three of those in my kitchen). If you really want to take this to extremes, who makes their own fish sauce? What’s the difference between not making your own fish sauce and not making your own curry paste? It could be worse, we could be stuck using Western “Thai” brands, whose products bear only a passing resemblance to the products from Maesri, Mae Ploy, and other Thai brands. Great comment, Gemma. Thank you. Thank you for providing such useful information on your web site. What brands of shrimp paste do you recommend? Is Thai shrimp paste the same as the Vietnamese mam tom? Both are fermented shrimp pastes? I am in Los Angeles and grow or can easily find all of the ingredients you list for fresh curry paste. The only one I’ve had difficulty with is shrimp paste because there are way too many options in the Asian grocers. I can and have used the commercial curry pastes in the past but my son has several food allergies including peanuts that make cooking from scratch important. I have to make this recipe. It looks delicious. 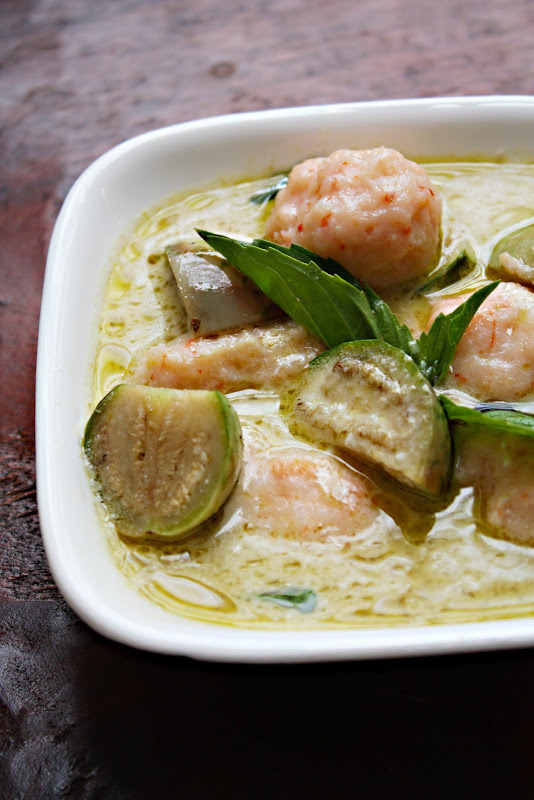 The blog evokes the tastes, textures, and I really love green curry, shrimp balls, and Thai eggplant, which I just happen to have a fresh supply of. I’d buy these two books, also, except so far I can only find sources that cost a small appendage to acquire. That’s why I prefer perfectly placed, powerful, potent kindle portrayals! Leela, why have I only just discovered your blog? I love food and your musings are educational and witty. I didn’t know green curry was supposed to split like that! I always thought I was going a bit wrong as my (Thai) Dad didn’t explain that bit to me! Yep, most brands, even formerly good ones, have resorted to using thickeners and emulsifiers in their coconut milk products now. This results in the coconut cream not splitting. No worries. Just fry the paste with some vegetable (coconut) oil and some of the coconut milk just until the paste becomes fragrant. I’ll write more about this in a future post. Ahhh I figured that must be the reason.. I’ll keep looking for a decent coconut milk brand but in the meantime I did resort to adding coconut oil to the milk/curry paste and it worked beautifully! The family was very impressed with the curry! Now to get the sticky rice to cook properly! Did I miss the recipe for this curry though? I see other people commenting on the recipe but I can’t find the recipe?